Last week’s bread-making adventure was inspired by the abundance of potatoes I had. I got some in my first LOVE Delivery veggie box, and then I got more in the second, so I figured I needed to do something with them. 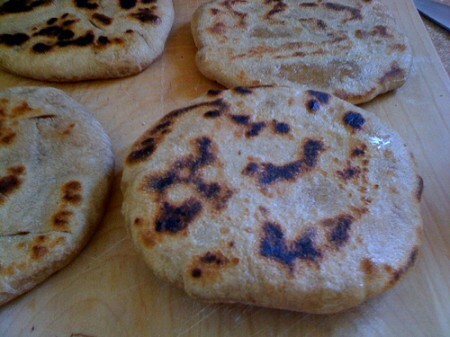 Looking through How to Cook Everything, I came across this recipe for potato-stuffed Indian flatbread, which came directly from a famous Indian chef with just a minor change in spices. I was intrigued, so I gave it a try. I boiled 4 potatoes. I created the very simple white and wheat dough that didn’t have any yeast in it, though was flavored with some cumin. Then I mashed up the potatoes with lemon, cayenne, salt and pepper. I created 12 little balls of dough, rolled them flat, then put about 2 tablespoons of the potato mixture in the center, folded the edges up, flatted them out and rolled them even flatter. On some the potato started peaking out the sides, mostly because I mashed them with a fork so there were still some rather jagged pieces, but in all, them came together easily. 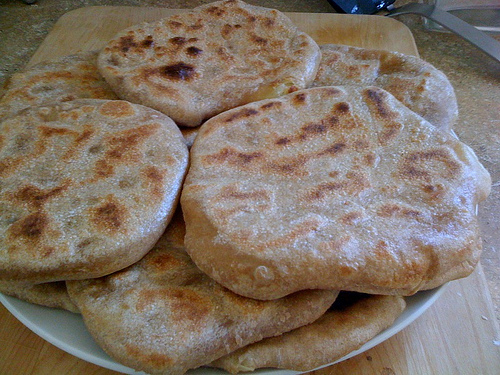 I then cooked them in a pan, 3-4 minutes on each side over medium heat, similar to how I did the English muffins. Some of them puffed up a lot while others didn’t really puff, though in the end they all tasted about the same. The first few, just like pancakes (and the English muffins, for that matter), got a little bit dark, but still tasted fine. Since potatoes and bread are both pretty dry, I decided to make a sauce/dip to serve these with, so I made a modified tzatziki. I used Greek yogurt, a few tablespoons of chopped onion, chopped cucumber, parsley, lemon, salt and pepper. It was simple and delicious, and worked well on the potato-stuffed bread.